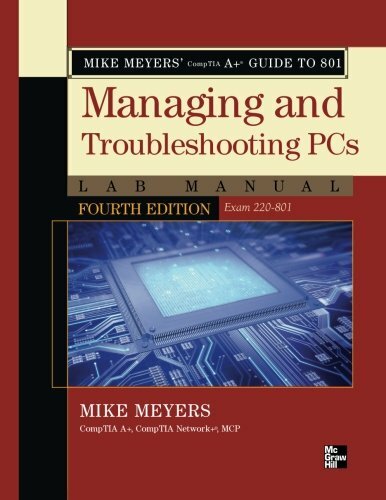 Mike Meyers’ CompTIA A+ Guide to Managing and Troubleshooting Hardware Lab Manual, Fourth Edition contains more than 75 labs that challenge you to solve real-world problems with key concepts. Clear, measurable lab objectives map to certification exam objectives, ensuring direct correspondence to Mike Meyers’ CompTIA A+ Guide to Managing and Troubleshooting Hardware, Fourth Edition. Lab solutions are only available to instructors and are not printed inside the book. The Lab Manual also includes materials lists and lab set-up instructions. Step-by-step, not click-by click, lab scenarios require you to think critically, and Hint and Warning icons guide you through potentially tricky situations. Post-lab observation questions measure your understanding of lab results and the key term quiz helps to build your vocabulary. If you have any questions about this product by Brand: McGraw-Hill Osborne Media, contact us by completing and submitting the form below. If you are looking for a specif part number, please include it with your message.